There’s an issue with my Goby, what do I do? We’ve got your back -- email help@goby.co and we’ll help you out. We recommend you also double check the user guide to make sure you’re using Goby correctly. Your goby has been traveling all over the world in preparation for this moment and may have lost its charge along away. For the first few days, we suggest letting your Goby sit on the charger between uses and recharge from its long trip. How long should I charge my Goby after it runs out of batteries? Once your goby runs out of batteries we suggest letting it charge for a full day. Using the dentist's recommended 150g of pressure a full charge will last approximately two weeks, brushing twice a day. Brushing harder will decrease the battery life and may damage your gums. Dentists recommend replacing your brush head at least every three months. To ensure you never forget, the power button also serves as a replacement head indicator. After three months of usage, the power button will illuminate blue to remind you to change your brush head. To reset the replacement head indicator light, hold down the power button for five seconds. 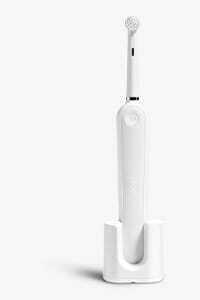 How do you brush your teeth properly with a Goby rechargeable electric toothbrush? Wet the brush head and apply toothpaste. To avoid splashing, position the brush at your teeth before turning on. In one quadrant of your mouth, guide the brush head slowly from tooth to tooth, spending a few seconds on each tooth surface. Brush the fronts, then the backs, and finally the chewing surfaces. A short vibration will alert you when it’s time to switch quadrants. Repeat Step 2 on all four quadrants. When your two minutes are up, the toothbrush automatically turns off. 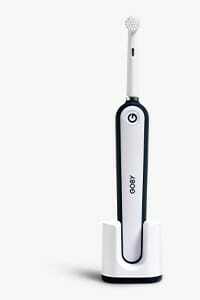 How often and how long should I brush my teeth with a Goby rechargeable electric toothbrush? Dentists recommend brushing your teeth for two minutes, twice a day. Where can I find directions for using Goby? Please view the user guide for additional directions. Can I buy a replacement charger or hygienic stand? Email help@goby.co and we’ll help you process your order for a new charger or hygienic stand. Dentists recommend replacing your toothbrush head at least every 3 months to keep your mouth healthy and clean, and we agree with them. When you subscribe, you can choose to get a new toothbrush head every 1, 2, or 3 months. Can two people share their Goby? We do not recommend that two people share a single brush head; however, two people can share a single brush handle and use their own, separate brush heads. While you should not submerge your Goby in any body of water, it is safe to use in the shower and in environments where it will get splashed with water. How do I replace my electric toothbrush head? 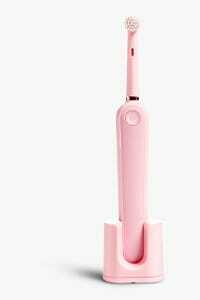 To remove the brush head, firmly hold the brush head and pull it upwards away from the handle. To add a new brush head, slide your replacement brush head down onto the handle. Are Goby brush heads compatible with other electric toothbrush brands? Our brush heads only work with a Goby toothbrush, and our electric toothbrush only works with Goby brush heads. Goby was designed in New York City and manufactured in Asia. Can I travel with my Goby electric toothbrush? Yes, we think Goby is the best travel electric toothbrush available on the market. Goby’s USB-enabled magnetic charging shell makes it easy to travel with your Goby electric toothbrush and charge it like you would your smartphone. My children really want to use my Goby. Are electric toothbrushes safe for children? We advise you to check with your child's dental professional before letting them use your Goby. In most cases, children aged 13-years or older can use a Goby. I just started using my Goby and my gums are bleeding. What should I do? In the first few days of using your electric toothbrush, your gums may bleed slightly. In general, bleeding should stop after a few days. Should it persist after 2 weeks, please consult your dentist or dental hygienist. I have sensitive teeth and gums. Can I use an electric toothbrush? Yes! 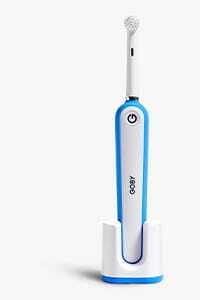 Goby’s toothbrush heads provide thorough cleaning and have soft bristles that are safe for sensitive teeth and gums. If you have sensitive teeth and gums, Goby recommends using sensitive mode. We currently ship to the entire United States and all US Military locations around the world via their APO, FPO & DPO addresses. In addition, we ship to Puerto Rico, Guam, the US Virgin Islands, and Saipan. Shipments to locations outside of the contiguous 48 states may experience slightly delayed shipping times. Ground shipment orders placed before 2:15 pm ET will ship the next business day. 2-day and overnight shipment orders placed before 12:15 pm ET will ship the same business day. My Goby hasn't arrived or was damaged during shipment, what do I do? Don’t worry, we’ve got you. Please email help@goby.co and we will assist you with your order. Ground shipping is free on all subscription orders and orders with a value of $10 or more. 2-day shipments are $12 and overnight shipments are $20. Do I automatically sign up for a subscription by ordering one or more brush heads? No, you only sign up for a subscription if you add a subscription to your cart. You will receive a shipment notification email that includes a tracking number once your order ships. Alternatively, if you created an account during checkout, you can check your shipment status and tracking number under the “Order History” tab. I need my order immediately, do you offer expedited shipping? Yes, we offer 2-day or overnight shipping to the contiguous 48 states. You can subscribe to Goby without ever leaving the home page -- simply click on the “Buy Now” button towards the bottom of the screen, choose a color, choose how often, and checkout! Visit the brush heads page if you already have a Goby toothbrush but still need to sign up for a subscription. Can I buy just the brush heads? Yes, you can buy brush heads with or without a subscription by visiting our brush heads page. I want to send Goby as a gift. What’s the best way to do that? The best way to gift Goby is by using our digital gift cards. Please visit this page to deliver Goby virtually. If you'd like to send the physical Goby Brush Kit as a gift, the best way to do that is to insert your own billing and payment info and the shipping address of the lucky person you're gifting Goby to during checkout. We try to send your order soon after you place it, which may limit our ability to change items in your order or cancel a shipment. If you're on a subscription, you can change the timing of your shipments on your Account page. For other orders, please feel free to email help@goby.co and we’ll do our best to resolve any issues. You can change or cancel anytime by visiting your Account page. This section allows you to make changes to your plan, including adding or removing brush heads, or changing the cadence of your shipments, which you can do by clicking into the Subscription section of your Account. You will be charged for your subscription once your replenishment order ships. You will be sent an email when your subscription order is about to be processed and another when your order ships. You can update your billing information any time. Please log into your Account page to update your Account Details, such as billing or credit card information. How does the 60 day trial work? We are so convinced you’ll fall in love with your new toothbrush that we invite you to try Goby risk-free for 60 days, starting from the day of receipt. If you decide Goby is not for you within the first 60 days, return it for a full refund. Email help@goby.co and we’ll send you a free shipping label that can be applied to the box your toothbrush came in. Return shipping is always on us. Once brush heads have been opened from packaging, we cannot accept returns. Does Goby have a warranty? Goby has a Limited Lifetime Toothbrush warranty -- details can be found here. Goby offers next level oral care with an electric toothbrush designed to improve oral health while still seamlessly fitting into the modern consumer’s lifestyle. Goby provides the tools consumers need, exactly when they need them, so they can maximize every minute they spend brushing, all at a fraction of the price of the competition. 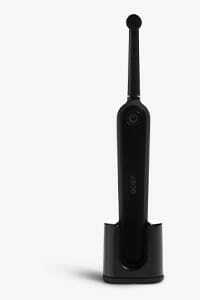 Is Goby's electric toothbrush registered with the FDA? Yes. Our rechargeable electric toothbrush is a Class 1 FDA device and is registered with the FDA. 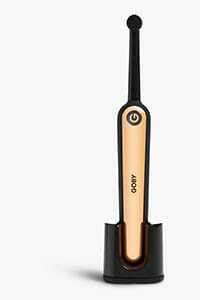 Why is Goby priced so much less than other electric toothbrushes? By partnering with the manufacturer and selling directly to you, we’re able to brush away markups and pass the savings onto you. We're proud to offer a premium electric toothbrush and excellent customer service to save you time and money. How does your partnership with NYU College of Dentistry's Global Student Outreach work? We donate a percentage of sales to NYU College of Dentistry’s Global Student Outreach program. A $1,000 gift supplies a primary school with fluoride varnish for one year and a $5,000 gift covers the cost of sending one dental student to a community for one week. I'm a dentist and I'd love to get involved. Who do I contact for more information? Please email dentists@goby.co to learn more, comment on our social channels or give us a call! We can’t wait to hear from you.